Mangga (mango) with “bagoong” is one of the favorite snacks of Filipinos. “Bagoong” is a Pinoy-style shrimp paste that is quite smelly but is really delicious for those who acquired the taste of it. 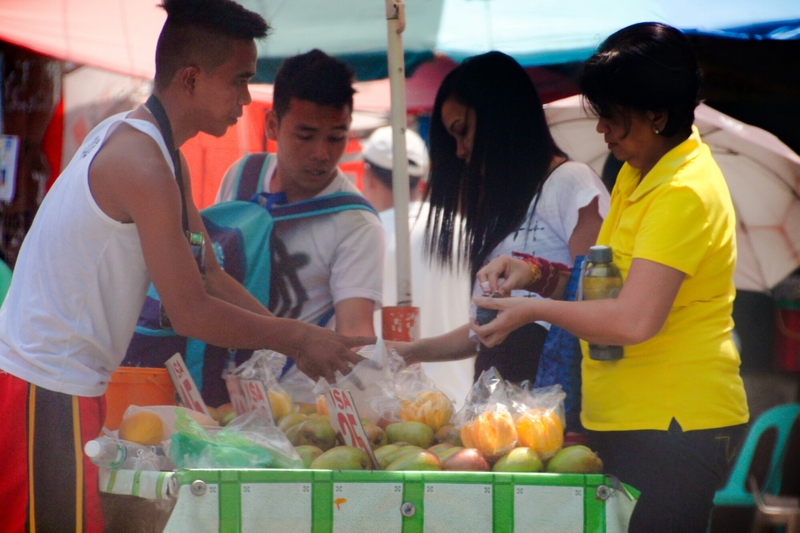 There are many ambulant vendors who sell mango with bagoong, specially in areas where there are many people. This boy had lots of customers by the minute… I think he has a secret bagoong recipe that made people buy his mango with the bagoong. There are a thousand ways on how to cook bagoong but the best ingredient in bagoong for me is.. At least 3 pieces of “siling labuyo”, a local chili pepper like habanero (though habanero is hotter than the siling labuyo). I like my bagoong super spicy and sweet to the taste. Yup… It never fails to make my mouth water! LOL!